You may be looking for your next job, a second job or just new to the island. WorkForce is a great resource for you to meet hundreds of employers in one place and find the position you’re looking for! No need to reserve your tickets ahead of time as the event is first-come, first-served. Lines do tend to form for the entrance, so arrive early! First impressions count! Please dress in business professional attire. Have your resume up-to-date and bring multiple copies. 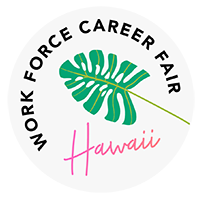 We do have a Online Hub available at each fair for those job seekers who do not have access to computers elsewhere, provided courtesy of Hawaiian Host. Do your research ahead of time about the companies you’re interested in and the positions they have open online. If you’ve already applied to a position online, introducing yourself to the recruiters at WorkForce is a really good next step to make yourself stand out from the rest of the candidates. 7-Eleven Hawaii•AAA Hawaii•ABC Stores•Access Lifts of Hawaii, Inc.•Aerotek•Aflac•Air Force Reserve•Ala Moana Hotel by Mantra•Alliance Personnel Inc.•Aloha Air Cargo•Aloha Petroleum, Ltd.•AlohaCare•ALTRES Staffing American Savings Bank•Ameriprise•Aqua Engineers•AT&T•Attention Plus Care•Avis Budget Group•BAE Systems Hawaii Shipyards•Bank of Hawaii•Bayada Behavioral Health,Habilitation & Home Care•Bellows Air Force Station•Bishop & Company, Inc.•Blackstone•Borthwick Mortuary•Bubba Gump Shrimp Co. & Mai Tai Bar•Central Pacific Bank•City and County of Honolulu•City Mill Co., Ltd•Community Empowerment Resources•Cutter Automotive Galleries•DFS Hawaii•Diagnostic Laboratory Services, Inc.•Diamond Resorts•Disney Aulani•Douglas Emmett Management, LLC Dry Bar•Elections Division•Employer Support of the Guard & Reserves•Enterprise Holdings•Express Employment Professionals•Fairmont Kea Lani, Maui•Fernandez Events L.L.C. (EK)/Fun Factory•First Hawaiian Bank•Foresite Recruitment•Four Seasons Resorts Hawaii•G4S Secure Solutions (USA) Inc.•Geico•Genki Sushi USA•Goodwill Hawaii•Ground Transport•Hana Talent•Hansen Distribution Group•Hawaii Air National Guard•Hawaii Army National Guard•Hawaii Behavioral Health•Hawaii FoodService Alliance•Hawaii Kai Retirement & Assisted Living•Hawaii Logistics, LLC•Hawaii Medical College•Hawaii Pacific Health•Hawaii State Department of Education•Hawaii State Federal Credit Union•Hawaii Transfer Company, Ltd.•Hawaiian Building Maintenance•Hawaiian Telcom•Hawktree International /Island Movers•Hertz Dollar Thrifty Rental Car•HI Employment•Highgate Hotels•Hilton Grand Vacations•HMSHost•Infinite Care - Plus•Institute for Human Services•Island Temporary Nursing•JTB Hawaii, Inc.•Kahala Nui•Kamehameha Schools•Kokua Care•KTM Services, Inc.•Kumabe HR•Lanakila Pacific•Leahi Swim School Inc.•Lori's Gifts Inc.•Marimed Foundation•Marine Corps Community Services•Maui Divers Jewelry Mutual of Omaha•Na Hoku•Naval Facilities Engineering•Navy Region Hawai•Navy Region Hawaii - NAF HR•NPO GLAD•Oahu Home Healthcare•Office Depot•Ohana Broadcast Company•Ohana Military Communities•Pacific Environmental Solutions•Pacific Missle Range Facility•Pacific Shipyards International, LLC•Palama Holdings•PAR Hawaii, Inc.•Paradise Bay Resort•Paradise Beverages, Inc.•Paradise Cruise Ltd.•Parents and Children Together•Paul Mitchell the School Honolulu•Pearl Harbor Naval Shipyard•Penske•Prudential Financial•Queen's Medical Center•Remedy Intelligent Staffing•Robert Half•Roberts Hawaii•Ross Stores, Inc.•Sagewater•Biki/Secure Bike Share Hawaii•Securitas Security Services USA Inc.•Servco Pacific, Inc.•Sodexo•Spectrum•Staffing Solutions of Hawaii•Standard Sheetmetal & Mechanical, Inc.•Star Protection Agency•State of Hawaii•State of Hawaii: Dept of Human Resources Development•Talent HR Solutions•Tamura Enterprises, Inc.•Target Corporation•The Arc in Hawaii•The Plaza Assisted Living•The Salvation Army•The Salvation Army Kroc Center Hawaii•Times Super Market•Transair•Transportation Security Administration (TSA/DHS)•U.S. Army Recruiting Company of Honolulu•U.S. Vets•University Health Partners of Hawaii•University of Hawaii•University of Hawaii FCU•Vets•W Contracting Inc.•WDI International, Inc.•WestPac Wealth Partners•Wilson Care Group•Wilson Home Care•Wyndham Vacation Ownership•Y. Hata Co., Ltd.•YMCA of Honolulu… and More!